Review Summary: Run to the money. I don’t want to make the same mistake as Roy Wilkinson. It’s a name you might be familiar with; in 1997, he made a boldly stupid claim about the boldly stupid Oasis album Be Here Now; ‘In a year’s time every home will have one.’ Barely a year later, every record store in the country had three, and Select magazine was railroaded for blithely claiming that, among others, ‘all of rock music ha[d] been leading to this point.’ It’s perhaps imprecise in the context of a perfect 10 praise, but consider the notion momentarily that all of rock music did lead to Be Here Now. Wilkinson gathers a lot of auspicious bedfellows-- Led Zeppelin, Iggy Pop, Pink Floyd, The Jam, The Beatles, Bon Jovi-- and ironically enough pinpoints just how Noel Gallagher managed to churn it into one big, muddy, chasamous, frazzled mess. The difference between Wilkinson and myself is that Wilkinson thought that monocultural fusion of every bad rock habit was somehow virtuous. When I listen to Migos’ Culture II, a similarly congested exercise in compressing a million trends into one washed out contrivance, I know that all of popular rap music has been leading to this moment, and that the result is utterly and completely vexing. D’you wanna know what isn’t vexing, though" That Migos were the ones that brought us to this moment. Since last year’s Culture, when “Bad & Boujee”-- and subsequently, “Slippery”-- propelled triplet flows and ad-libbing into Chart territory, Migos have occasionally excelled (as in “Slide”) and more frequently flubbed (as in “Bon Appetit”). Offset got engaged to Cardi B, and made a credible case for being most likely to succeed solo with Without Warning; Quavo fucked up and appeared on “Strip it Down;” Takeoff became a meme. They all made some bizarre comments about homosexuality. All the while, their tyrannical presence reigned, increasingly destroying their own ability to hype each other as much as hold onto one another as a lifesaver. In more ways than one, Migos defined the current moods and movements of our pop culture, not least of all by seeping into its most banal crevices and propping up silly things like dabbing; with Culture II, they are merely building financial success and cultural dominance on the margins we left for them, and we all should be humbled accordingly. I know I am. When I reviewed Culture almost a year ago to the day, I applauded Migos for their, ‘uncompromisingly basic approach to songwriting [which is] their greatest strength.’ For what it’s worth, I still stand by that opinion. Culture, though riddled with enough embarrassing and slightly wince-inducing choices to make me feel more than a little ashamed of that praise, is about the closest that popular rap music has come to finding a representative moment (excluding maybe Rodeo, or DS2). I also made a point of criticizing ‘the ongoing issue with retail rap records’ featuring far too plentiful guests without enough decent beats to show any real variance or versatility in sound, ending that thought by claiming that Migos ‘buck the trend.’ Yikes. If Culture II is anything, it’s all of those things; it’s more than 100-minutes, features more profitable names than is absolutely necessary, and conforms to trends as if they’re tropes. It’s not as much of a sequel as it is an opposing force of poor taste and worse curation. Of course, most of that criticism relies on self-evident truths; that, in composing an album, Migos particularly care about taste, or what a white guy in his twenties in the suburbs thinks about the culture. At the end of the day, I still listened to all 24 songs on Culture II, and I still fell asleep and gave them another couple of streaming figures on top of that because this album has been released as a looping playlist. Though this thing is a failure of artistic composition, it is an innovative money-making exercise; presented on Spotify as a looping playlist, Culture II’s neverending tracklist and search-engine gaming name-dropping is the culmination of everything that musicians have been grasping at in order to game the system for more cash. So maybe I’m wrong; maybe this big and bullying mess of a rap album is actually a safer alternative to selling drugs, or doing anything that Migos advertise throughout as a part of the culture. I won’t begrudge them for that. Unfortunately, this isn’t Bloomberg, and I’m not reviewing the latest efficiency scheme for data presentation. I’m reviewing music, and the music on Culture II is bad. And no, the irony isn’t lost that it has taken me this long to talk about the music here, in part because it shouldn’t be such a relative non-factor in this discussion. But so much of Culture II, whether it be its sullen and lifeless production, or its cynically placed guest appearances that violate the entire purpose of a group dynamic, doesn’t register as a talking point because it feels like the filler found on any mainstream trap rap album. That’s true of its Gucci Mane feature, or its Metro Boomin production credits, or its references to Quavo covering “The Star-Spangled Banner” that are now over 12 months old. It’s also true though of the moments wherein this album is meant to rise above its status as a sequel: Kanye West turns in production on “B.B.O.,” and you couldn’t even tell unless somebody told you; Drake turns in a verse on “Walk it Talk it,” and you can only tell because he makes it inexplicably harder; Quavo apparently has production all over this thing and it’s not even slightly noticeable or worth writing about. That’s without going into “White Sand,” the obligatory posse cut, or the production, most of which wouldn’t sound out of place on a free mixtape, or the lyricism, all pointless flexes on boring topics that span the surprisingly not broad spectrum of dope and Pateks. And for an album supposedly about culture, it's hard to take claims that Migos are ‘do[ing] it for the culture ‘cos they gon’ bite like vultures’ seriously when they feature Post Malone on the victory lap. In all, it adds up to a cynical and unaccomplished shot at profiteering. It’s honestly just depressing to listen to. There are a handful of songs that are worth picking out for a listen, like “Stir Fry,” that hint at the possibility for Migos to seek status as a modern day Outkast or Clipse. And there are a handful of songs that aren’t completely devoid of merit, like “Narcos” and “Emoji a Chain,” which will probably be hits despite themselves. 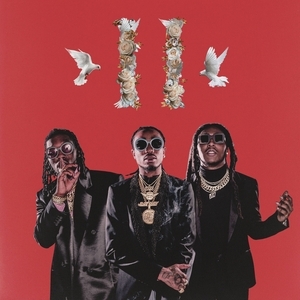 In fact, there are moments, lines, and performances all over this thing that scantily hint at possibilities; there’s the surprisingly consistent, melodic, and addictive verses from Takeoff, or the relatively competent and standard production from Quavo, that implies a decent and tidy album exists somewhere among the drek. More often than not, though, Culture II sounds like a satire of every other rap album released by a major label these days, catering to the lowest common denominator of casual music listener. As a business decision, it’s genius; as a piece of music, it’s little more than an elaborate consumer scam. "hint at the possibility for Migos to seek status as a modern day Outkast or Clipse." why does every hip hop revirw have to contain comparisons to rock music? you've got a slight typo w/your html for italicizing "Culture" in the second paragraph, just fyi. Good review, though the intro isn't really working for me.. Solid review of a weak album. so you're trying to say that they tried to play us but instead they played themselves?